Here's wishing everyone who celebrates Dong Zhi (冬至) Festival, a very happy winter solstice! We celebrated this festival by eating red bean tong sui (sweet soup) with tong yuen (glutinous rice balls) at my mother's place one day earlier. Happy Dong Zhi to you and family too! We had dinner at mil's house yesterday although the real day's today coz everyone will be working.. Same reason we did it early too. Too sticky I guess that it sticks to your throat. Happy Winter Solstice to you and your family, Mun.. we celebrate by having a feast (after offering to ancestors) as well as plain glutinous balls in brown sugar syrup.. I like those chewy balls. Today?! I thought is tomorrow.. OMG.. Happy Dong Zhi to you and family too! So did you call you mom in time to wish her? I was offered these at dinner yesterday but didn't have any as I don't quite enjoy gooey balls in a sweet soup. No mochi for you either? 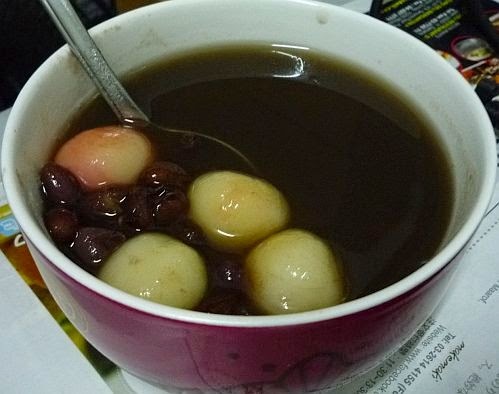 yummy..next time I will cook red bean dessert and put those glutinous rice balls into it. happy Winter Solstice to u too! Happy Dong Zhi, Mun! I love glutinous rice ball and what's not in my fav red bean tong sui. Mun, happy Winter Solstice to you. I love these tong sui with glutinous rice ball. Thank you. They sure taste good. Hope you enjoyed your evening Mun!! I also got to taste the tong yuen.. my sister made a lot this evening... actually she bought 3 packets from Jaya Jusco... very nice! I didn't know it was the day until my dear got me dong zhi that her mom made. It was delicious! I have never eaten with red bean soup. It's always with either white or brown sugar syrup. With ginger or not in the sugar syrup?